With so many people now clicker training there is no longer a clear one-size-fits-all definition of what this means. People use the term “clicker training” to mean so many different things. Some people use the click as a keep going signal. For others it is linked always with a reinforcer. For some it is simply one of the many “tools” they use to modify the behavior of their animals. Others see it as the framework under which they organize all their training. If you are new to clicker training, these different approaches can be very confusing. What approach do you try first? Whose methods should you follow? Think of it like going to the grocery store to buy some butter for a new brownie recipe you want to try out. At the grocery store you’ll have several choices. There’s salted and unsalted, organic, whipped, even butter from sheep’s milk instead of cow’s. There is also a whole array of margarines that are packaged to look just like butter. If you don’t know the difference, you might well end up buying the margarine because it costs less. But when you make your brownies, you’ll be disappointed. They aren’t anything like the wonderful brownies your friend made. When you ask her what her secret is, she tells you she uses only real ingredients – real butter, not the butter look alike, along with fresh farm-raised eggs and organic flour. Clicker training is the same. You want to use real ingredients that are well-grounded in learning theory. With so much being presented about clicker training on the internet, it is sometimes hard to tell what you are getting. Because there are so many different versions of clicker training emerging, I thought it would be useful to outline how I define and use it. Let’s begin with Karen Pryor’s definition. Karen Pryor is the author of “Don’t Shoot the Dog”, and “Reaching the Animal Mind”. She is one of the early pioneers in the use of marker signals. She defines clicker training as applied operant conditioning in which a marker signal is paired with a positive reinforcer. This is a good start. It describes the process we use in the training. When our learner does something we like, we mark that with a distinctive signal which is then paired with something the learner will actively work to gain. The marker signal gives the learner very precise information about what he did that has earned reinforcement. This makes it easier for him to offer the behavior again in order to get more of the reinforcer. Adding in the marker signal takes a lot of frustrating guess work out of the learning process. When it is consistently paired with things the LEARNER wants, YOU get more of the behavior you want. It’s a win-win situation for both of you. This is a good starting point, but for me clicker training is much more than this procedural definition. Clicker training is a reflection of my core beliefs about animals and the relationship that I want to have with them. It is the “umbrella” under which I organize all my training. It includes procedures and lesson plans, but it is grounded in science and built on a solid bedrock of ethics. It is a detailed, complete training program that can take a horse from his very first interactions with people, through his early training, his start under saddle, and on into his performance work. It is used to teach beautiful balance that helps to keep horses sound. It carries on throughout the life of the horse, helping the handler to maintain lessons already mastered and to teach new skills. Through each stage in a horse’s life, clicker training is there to enhance the relationship. It provides clear communication for our performance horses, playtime for our family companions, and enrichment for our equine friends as they enter their geriatric years. I focus on the behavior I want – not the unwanted behavior. This is the major keys-to-the-kingdom hallmark of clicker training. I’m not trying to correct unwanted behavior. I focus on what I want my learner TO DO. I understand that I can’t ask for something and expect to get it on a consistent basis unless I have gone through a teaching process to teach it to my learner. This is my safety net. It keeps me from over facing my learner. Instead of assuming my learner understands what I want, I go through a teaching process that fills in any holes he may have. If my learner fails to give me a desired response, instead of escalating pressure or punishing him for his failure to respond, I break the training down into smaller steps. I recognize that while punishment can be an effective management tool, it has significant negative consequences. I actively choose to avoid the deliberate use of punishment throughout the whole of my relationship with my learners. I also recognize that trial and error learning can be frustrating. Using extinction processes where I wait out my learner while he tries different options is a learning strategy that I try to avoid. Instead I look for creative ways to help my learner to be successful. This involves using a variety of teaching strategies, breaking my training down into very small steps, and setting up the environment for success. I know that it takes time and experience to become a skillful shaper. I know that everyone who explores this approach to training will make mistakes. As we gain experience, as we learn from our horses and from other trainers, we will find better ways to train. I very much subscribe to an expression I learned from the poet Maya Angelou: “When I was young, I did the best I could. When I knew better, I did better.” That is a good mantra to keep in mind for all our interactions with our learners. The sharing of the discoveries we make is part of the enjoyment of clicker training. The intent is not to set the training “in stone”, but to keep evolving the process for the good of our learners. Note throughout this I have used the term learner, not animal. As a clicker trainer, I want to treat people and animals with the same regard for their emotional well being. I recognize that getting it right with people can be much more challenging, but if I am using positive reinforcement with my animals, I should also treat people in the same constructive way. So how exactly does all this work? When my learner gives me the response I’m looking for, I mark that behavior with a clear, distinctive, consistent signal. That’s the “click” in clicker training. It can be made with a plastic clicker, but more often I use a tongue click. The click is ALWAYS followed by a reinforcer. There are some people who use the clicker in a different way. When they click, they may reinforce, or they might ask for the behavior again. The click serves more as a keep going signal. Other indicators, such as reaching into the treat pouch, become the clearer marker signal for the horse. This is NOT how I use the click. The click is a cue. You use and respond to cues all the time. If you were to say “come” to a dog, you would want “come” to mean “come”. You wouldn’t want it to mean “come” this time, but next time it means spin in circles. That doesn’t make any sense. The same holds true with the click. It tells your learner that he has just done something you like, and he should now go into treat-retrieval behavior. That means he first orients to you, the handler, to find out where his treat is going to be delivered. Are you going to bring it to him, or does he need to come to you to get it? That’s just a detail. What he can count on is: if I click, I’m going to treat. That’s a pairing that I want to keep very clear to avoid confusion and frustration. When I was first exploring clicker training, I watched canine behaviorist Gary Wilkes with his cattle dog, Megan. She was a clicker superstar, especially when Gary gave her new puzzles to solve. Gary used treatless clicks as a shaping tool. Megan would become frustrated when something that had just gotten a click and treat now only earned her a click. In her frustration she’d try harder or she’d offer something new. That’s what Gary wanted. He was using treatless clicks and the frustration they caused to get behavior to vary. Gary warned people about falling into patterns. Humans like patterns and our animals are very good at spotting them. So he cautioned everyone who was experimenting with treatless clicks to watch out for inadvertent patterns. First: it may have been okay for Gary to use treatless clicks with Megan. She seemed emotionally resilient enough to work through the frustration, but I was going to be sitting on the animal I was training, and frustration didn’t seem like a good shaping tool to be using. I didn’t need to rely on this strategy. I had other ways I could get behavior to vary. Second: I could be much clearer if I clicked behavior that met criterion and reinforced EVERY time I clicked. That avoided the trap of falling into patterns. What I varied was not whether or not TO TREAT, but what to use as my reinforcer. Gary Wilkes was one of the early pioneers of clicker training. He helped introduce clicker training into the dog community. Since those early experiments, we have learned a great deal about how to set up our training plans for success. We don’t need to rely on treatless clicks and other extinction processes in our training. There are better techniques available to us. This can sound as though I am clicking every little thing that my learner does. This is not the case. I am clicking on a one to one ratio. Every time my learner meets criterion, I click and treat, but the complexity of the behavior I’m looking for will be increasing over time. What was reinforced in a previous session is now a component of a larger chain of behaviors. I’ve moved on in terms of what I click. That changes over time, but always – if I click, I treat. Reinforcers are chosen from the perspective of the learner. There are many things horses find reinforcing: a roll in a sand pit, taking a nap with your equine friends, a run across the field on a cool day. That’s just a small sampling of the many things horses enjoy. The problem with this list is these aren’t very practical to use in a training environment. We need reinforcers which can be delivered in small, repeatable “packets”. Once a horse has had his roll, he usually doesn’t want another right away. And anyway – if he’s got a saddle on, his person isn’t going to be too pleased to have him rolling! So with horses the easiest reinforcer we can use is food. Food is such an effective reinforcer that many people shy away from it. They will tell you that you can’t use food around horses. They will be distracted. They’ll mug you for the treats. They may even bite. All of this is true is if the food is not well managed. In clicker training the foundation lessons all center around teaching the horse safe manners and emotional self control. Instead of running away from using food, we use it to teach great manners. Once those good food manners are established, food can then be used as a reinforcer for other behaviors we want. When you teach behaviors using positive reinforcement, the behaviors the horse has learned can become reinforcers for the next new thing you are working on. So food is not our only reinforcer. We use the behaviors we’ve taught as conditioned reinforcers. All of this strengthens the overall bond we have with our horses. Choice is a huge reinforcer. When horses feel in control, they feel safe. So giving horses the freedom to experiment, to make choices, to make mistakes without the fear of punishment is hugely reinforcing. Food may appear to be the reinforcer we’re using, but it is really choice that underlies the whole system. What we do not rely on in our training is motivating our horse by taking away his feelings of safety. This is often used in traditional training where escalating pressure is used. If a horse is afraid, the most reinforcing thing you can do is give him back a feeling of safety by removing the pressure. We can certainly work with fearful horses, but we work hard to structure the training and the environment we’re working in to minimize fear. We do not want to be adding fuel to the “emotional fire” through our actions. I recognize that even with the best of intentions “Life” can happen. A horse can unexpectedly become afraid. I need to know how to manage these situations to keep both of us safe. Sometimes that means moving to a more familiar, secure environment. Sometimes it means asking for less. Whatever the choices, I need to have the handling skills to manage the situation. But I do not manipulate the horse’s fear levels to appear to be a source of safety and security. I do not escalate pressure and then remove the pressure when the horse complies. This falls outside the parameters of clicker training. What do we teach? : Horse Friendly Behaviors. Clicker training is a very powerful teaching process. That means we need to be ethical in how we use it. For example, I can easily teach a horse to orient to a target for a click and a treat. I can imagine how I could then teach that horse to track the target up until he was rearing up on his hind legs. I could then teach him to stay up and to walk the length of my arena on his hind legs. It’s easy to design the lesson plan for this, but just because you can doesn’t mean you should. Having a horse walk upright on his hind legs certainly makes for a showy circus trick, but it does nothing for the long term soundness of that horse’s joints. So what DO we teach with the clicker? 1.) Basic handling and husbandry skills such as leading, grooming, foot care and other health-related procedures. 2.) General good manners and emotional self control. I know that clicker training can be used to teach a huge variety of behaviors. No matter what your interests are: jumping, dressage, reining, endurance riding, horse agility, pleasure riding, etc. clicker training can help you achieve your performance goals. Over the years I’ve made a huge effort to make clicker training as all inclusive as possible. I don’t want to exclude someone who rides in a western saddle because they see me riding in a dressage saddle. However, in that effort to be so very all inclusive I think the keys-to-the-kingdom core of clicker training is sometimes overlooked. There are two words that describe what I think should be at the center of every training program and they are: GOOD BALANCE. Too many times we see riding break horses down. Most of us have seen horses who live with the chronic pain that can result from hard riding. I’ve heard trainers state outright that riding damages horses. They will tell you that if you ride, you are breaking your horse down. That has NOT been my experience. What I know is good riding can actually help horses stay sounder and be healthier. My horses are family. It’s important to me that they stay as comfortable and healthy in their bodies for as long as possible. With the good nutrition and medical care we can now provide, horses are routinely living into their thirties. So keeping our horse companions sound doesn’t mean for a year or two. It means for decades. So the core of clicker training is teaching good balance – mental, physical and emotional. Tricks are fun. Riding is fun. But the core foundation is balance. To be a complete clicker training program balance needs to be a key component. Clicker trainers use a variety of teaching strategies to help their equine partners succeed. Think of your own learning experiences. In some situations you want to puzzle your way through to find an answer. And in others you just want to be given the answer. One of the keys to clicker training is understanding that there is always more than one way to train every behavior we want. Clicker trainers design their training to meet their learners needs. How they teach a particular behavior is based on the past history of their learner as well as how they plan on using the behavior. Teaching strategies include: targeting, free shaping, modeling, capturing, and mimicry. It also includes the use of pressure and release of pressure. This last one may surprise you, especially after what I just said about escalating pressure. Often people are first attracted to clicker training when they see the “magic” of shaping, or the ease of targeting. There is no pressure. They’ve seen how much force is commonly used in horse training, and they want no part of it, so they are surprised to see pressure included under the clicker umbrella. But if we put halters and leads on our horses, if we are going to ride our horses, we need to teach them how to respond to pressure. Pressure and release of pressure is a wonderful teaching tool. Here’s the key to understanding how this works. Pressure and release of pressure is used in conjunction with the click and the treat. It provides hints, clues, guidance that helps the horse get to his reinforcement faster. It is information. If a horse does not respond promptly to our requests, we don’t intensify the pressure. Pressure should not escalate or become painful or fear inducing. It is never used as a threat as in: do it or worse things will happen. Instead, if a horse is not understanding what we want, we break the lesson down into smaller steps. The work evolves through small stair steps. By the time you are ready to move on, the next step is already popping out ready to be reinforced. That’s one of the keys to understanding good clicker training. We break training down into small, achievable steps to keep the puzzle solving fun for the learner. Clicker trainers take care designing their lessons and setting up the environment so learning progresses in these small, achievable steps. There’s a wonderful expression: “Good training should be boring to watch.” This means that there shouldn’t be any wild “fireworks” going on in the learning process. Each new step is just a small, manageable stair step away from the preceding step. Good clicker trainers are splitters, not lumpers. If you are used to conventional riding, you might not recognize the early lessons in the clicker training teaching progression. Because we tease every lesson apart into very small component pieces, the beginning steps will look very different from conventional training. From a clicker trainer’s perspective where most people begin is at a very “lumped” stage in a teaching progression. My personal riding niche is classical dressage. I have learned to use the movements of dressage to help horses find their own beautiful balance. It is this balance that promotes lifelong soundness. The building blocks of this work can also be used to ride a dressage test, develop your jumper or cross country horse, train your western performance horse, prepare your trail horse etc. Whatever your riding goals are, The Click That Teaches training program will help you achieve them. 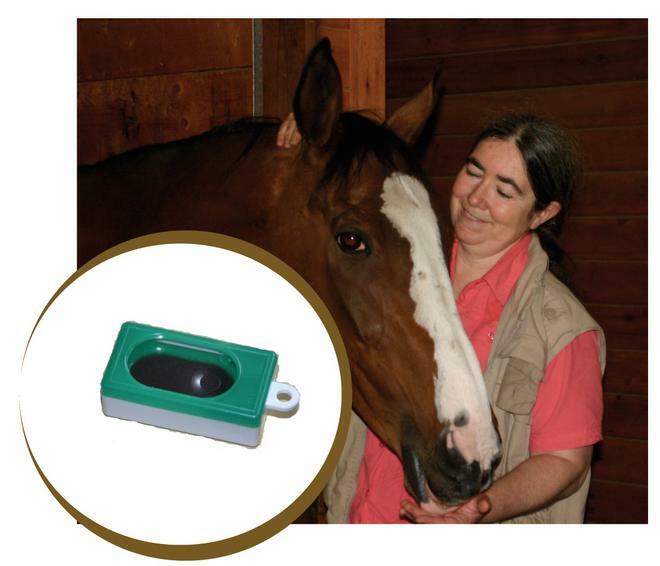 What Kind of Horses Benefit From Clicker Training? All horses. No matter the breed, age, size, or training history, clicker training is good for horses. The starting point is not always the same. A very young foal can certainly be clicker trained, but you’ll be using scratches instead of food for reinforcement. Aggressive horses will need to begin with more protective contact. Very fearful horses may need you to be clicking for any sign of relaxation. Food may not be a strong reinforcer for them yet. They’ll appreciate much more having you look away to give them more distance. Super reactive horses may need you to spend a lot of time clicking for any outward sign of calmness. And starved horses may need more time settling in to the idea that food is not something to become anxious or overly excited about. They are now living in a world where food will not be withdrawn or denied to them. All of these horses can be worked with using the principles and methods of clicker training. The Click That Teaches provides a thorough, detailed training program that will help you train the horse you have. Clicker training is not a recipe. It is not a one-size fits all form of training. Clicker training is an approach to training that empowers YOU the handler to find the solutions that will help you and your horse develop a super relationship. It is a dynamic, creative, FUN process. Sometimes you will have to go have the proverbial “cup of tea” while you have a think about a particular puzzle your horse is presenting. You’ll get ideas from the books, DVDs, on-line course and other material. You’ll also get ideas from others who are using clicker training. But remember this is not a recipe driven type of training. You’ll be using the principles and structure of clicker training to develop a training plan that is tailored to your own horse’s needs.